A few days ago we introduced several new additions to our dictionary lookup mechanism. 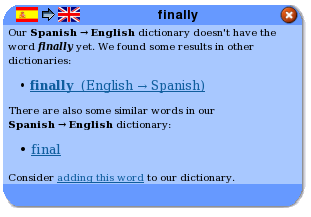 The long-awaited updates work both in the tooltips (when you click on a word in the web viewer or file viewer) and on our search-as-you-type dictionary page and make it much easier to see useful results in case the exact word or phrase you searched for isn't found in our dictionary. The most often requested update is our new spellchecker! If you mistype a word, or click on a misspelled word on a website, Lingro will show you suggestions for the correct spelling from our dictionary. Simply click on the word which you were looking for and a tooltip will open with relevant translations or definitions. In many cases a word missing from one of our translating dictionaries will have a very accurate definition in the same-language dictionary (for example our English dictionary has over 200,000 words and most dictionaries from English to another language have less than 100,000 words). 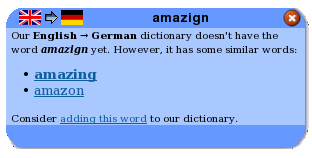 If you stumble upon a word missing from the dictionary you're searching, but for which a same-language definition is available, Lingro will show you a clickable link which opens that definition. That way, even a direct translation isn't available for the word you're looking for, you can still get some information about its meaning. 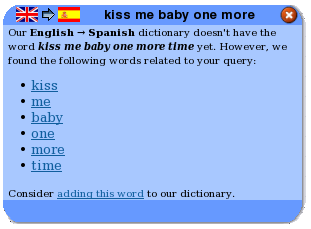 Also, if a word isn't found, Lingro will show if there are any results in the "opposite" dictionary (so that searching for a Spanish word in the English -> Spanish dictionary will show a match for Spanish -> English if one exists). If you were ever surprised that a very common word isn't available in our dictionary, and then discovered that you had the dictionary "switched" (it happens to us all the time! ), this will save you a lot of time and frustration. Sometimes it's very useful to translate an entire sentence -- Lingro's database has translations for many common phrases and idioms, but for complex sentences it's very rare to find an exact result in any of our dictionaries. If you type in a phrase or a sentence into the Lingro toolbar or search-as-you-type dictionary and a direct result isn't available, Lingro will look at your phrase and see which of the words exist in our dictionary. A list of all found words will appear, and you will be able to click on each word to open a new tooltip with that word's translation. Hint: you can also use this capability to quickly see translations for several unrelated words. Just type in the words you want to translate separated by spaces, and when the tooltip opens with a list of words found in our dictionary simply click on each of the words to see its translation. We encourage you to let us know what you think about these updates as you're using the site. You can leave a comment here, or get in touch with us through the contact page. Happy translating!